My dog says he LOVES this comic. 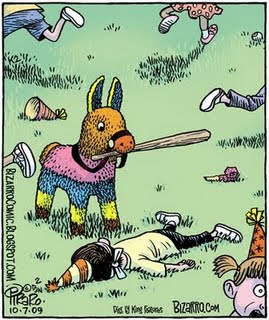 Why are pinatas always animals? Can't kids use a bat to beat the heck out of something else? Thanks for taking the time to comment on my blog, Darren. Dan Piraro has amazing comics that are always pro animal. He's the best. And so are YOU! Thanks for everything you do to help animals. The world be a better place if more people cared as much as you. I will give Faith a kiss for you, but, hey, where's mine?